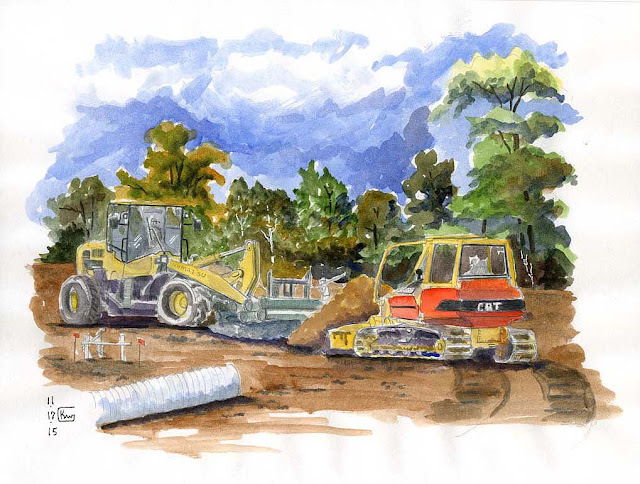 A new fire station is being built in my community and it gives me an opportunity to sketch the process. I enjoy watching and sketching construction. The large machines seem almost to be living organisms working side by side with the construction crews. Artistically, the machines create interesting shapes and complexity on the page, and provide a foil for the surrounding landscape. The new station is adjacent to a small lake and park. A senior center will be part of this complex with access to the lake’s walking trails. There are two parking lots adjacent to it so I can park and sketch from my car. 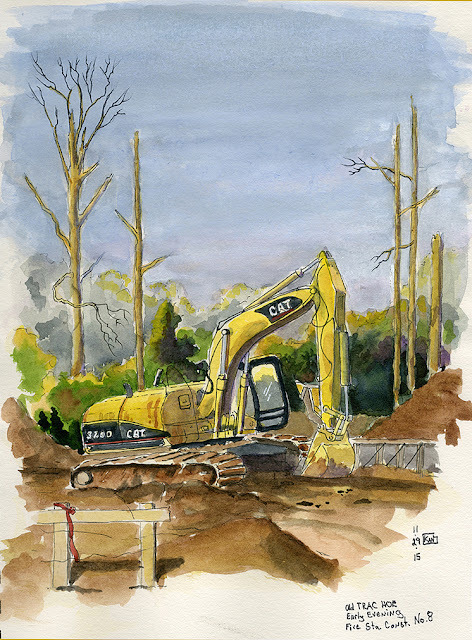 Construction began with tree and brush removal. Uprooted trees were piled together. 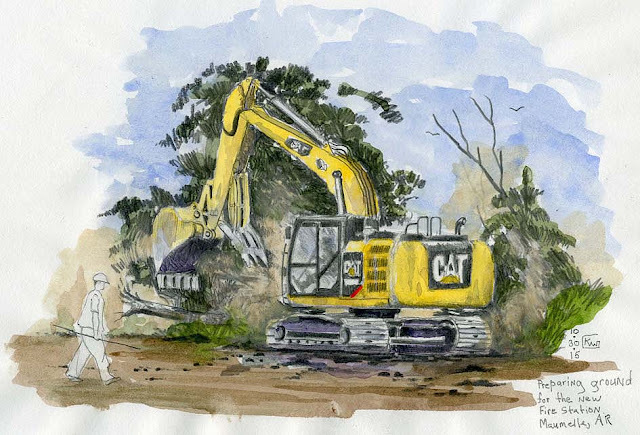 Large excavators with jaws attached to the bucket were used to shake soil from the tree roots before they were hauled away. The dust from this operation often obscured the entire work site and drifted across the street to my car, forcing me to close the windows. The excavator looked like an angry dog shaking a bone as it moved from side to side. Sewer and water lines soon followed. 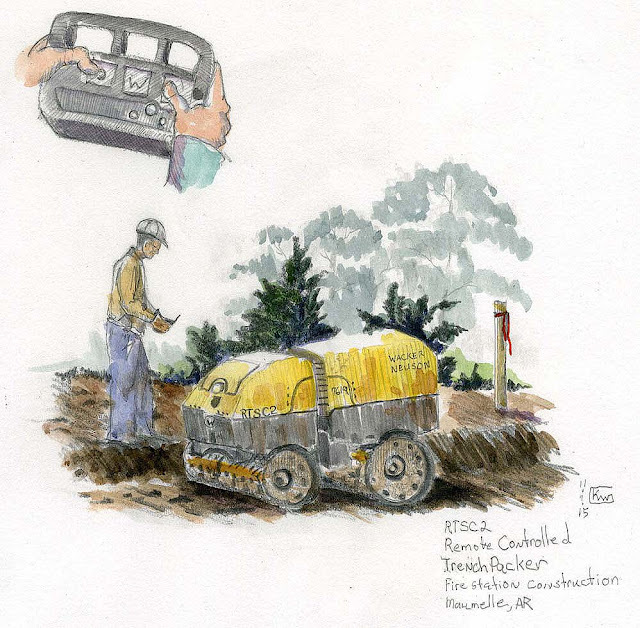 The most fascinating aspect of this was the use of a small, remote-controlled trench packer. These are operated like remote-controlled toys, although they have many safety features to prevent them accidentally hitting the operator. I cannot help thinking what a fun toy this could be. 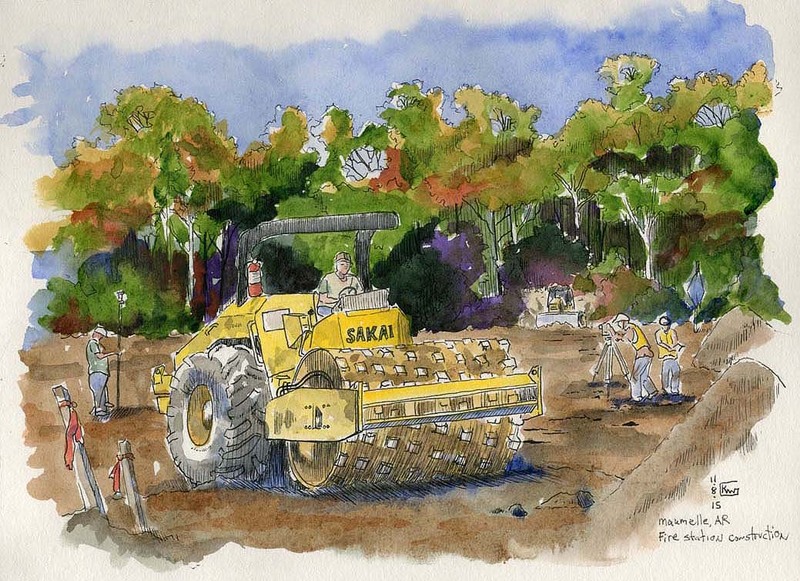 Large soil compactors leveled the construction site after an initial smoothing by dozers. The pad-foot rollers on the front of these machines can vibrate, improving compaction as they roll along. Some machines have vibration-isolating cabs for the operators. 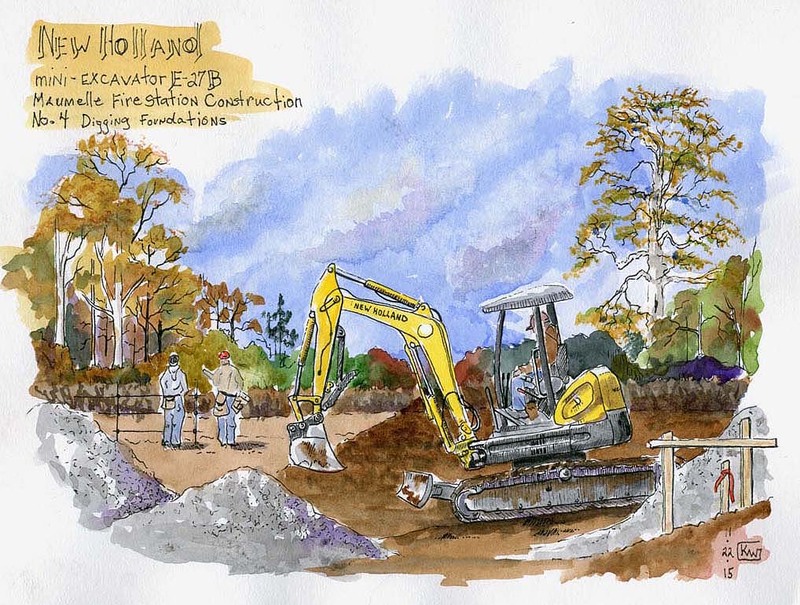 Although it was November when most of these sketches were made, foliage has only partially begun to change color and most leaves are still on the trees. A dozer and a pipe loader meet and park briefly before going about their business. The work at the construction site appears choreographed at times, with every action done in the appropriate sequence. Several small excavators were used to dig the outer trenches of the foundation. Concrete poured into these trenches supports the concrete slab that will form the floor of the building. This mud-caked excavator looked tired and old in the evening light. It was resting on its bucket like an old man leaning on a cane at a park bench. The large trees in the background have been broken and scarred by the construction. It is nearly December now and leaves are beginning to fall from most trees. Landscape colors are taking on the warm grays of winter. The green of the many interspersed pine and cedar trees provide contrast that highlights the winter’s muted colors. The weather is unseasonably warm and I expect the foundation to be poured and finished quickly before freezing weather arrives. Kenneth Williams is a semi-retired science illustrator from Little Rock, Arkansas, USA. See more of his science illustrations here and his previous guest post from Crail, Scotland, here.